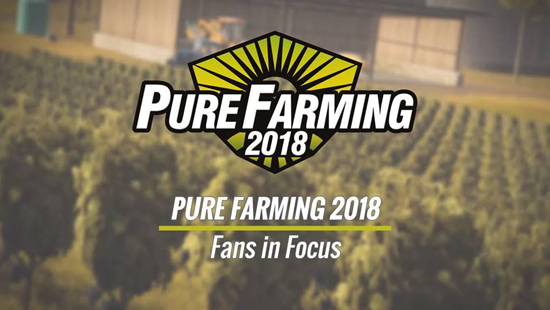 Techland Publishing and Ice Flames are delighted to announce that Pure Farming 2018 – has been approved by Sony for PlayStation 4 and Microsoft for Xbox One release. The game launches on March 13th for PC, PlayStation 4 and Xbox One. This information comes after a trailer-load of announcements over the past few months, including a fleet of fully-licensed and faithfully recreated machines from brands such as McCormick, Zetor, Landini and Mitsubishi and three distinctive game modes that will fit everyone's playstyle. Whether you’re cultivating land and growing crops, or breeding livestock and producing green energy, Pure Farming 2018 allows you to travel between Europe, Asia, and both Americas to plant region-specific crops such as hemp, coffee beans, cherries, and olives using dedicated farming vehicles. The game encourages you to play the way you like best and there are three vastly disparate modes meaning there’s something for everyone, regardless of whether you’re a simulation veteran or an enthusiastic newcomer. Developed by Ice Flames and published by Techland Publishing, Pure Farming 2018 will be available for PC, PlayStation®4 and Xbox One on March 13th, 2018.